All savvy elk hunters know that the real work while elk hunting begins once a dead elk hits the ground. Getting an elk out of the wild and into your freezer not only requires a crazy amount of effort, but it takes proper planning and logistics as well. Hunting in a productive area that can offer multiple chances at success is paramount to making an elk plan come together. Here are my choices for the top four places to fill your elk tag on public land. One of the few western states where tags are easier to come by, Idaho offers plenty of rugged wilderness public lands to get the job done. The St. Joe National Forest and the Clear-Water National Forest near the state’s southern Panhandle, are the best bets for high-success. Southwestern Montana provides half of the entire state’s elk harvest. The hot spots are the Beaverhead National Forest and the Deerlodge National Forest, which are in Region 3. There are a lot of mountain ranges and plenty of prime elk habitat. Tags are a little spendy in Montana, but well worth it. Bowhunters can enjoy over-the-counter tags for both Rocky Mountain elk in the central and eastern part of the state, and the coastal Roosevelt elk. The best place to get on some Roosevelt elk is the Siuslaw National Forest. Just a little over an hour’s drive from the state capital of Salem, OR, this coastal honey hole is home to a large concentration of the largest bodied elk in the country. The two best hunting units are the Alsea and Siuslaw areas. 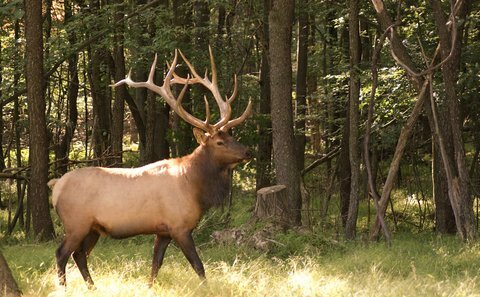 Rocky Mountain elk are also very numerous in the state, especially in the northeastern and eastern areas. The best spot on the planet to have opportunities at putting an elk down, northwest Colorado is home to the largest elk herd in the country. The White River National Forest and the nearby Routt National Forest literally hold more elk than anywhere else in the world. Not only can non-residents hunt the wilderness areas here (unlike Wyoming), but they can enjoy some of the highest success rates. Also, northwest Colorado has tons of BLM land that hunters can use to rifle hunt migrating elk later in the year. The best part about this location is that hunters can actually kill elk in a place that is not considered high altitude.